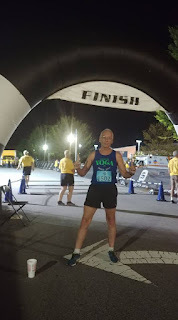 I've been racing for 40 years, this was the 40th edition of this race and it was the first race of the 40th Running Journal Grand Prix Series so it seems appropriate that I opened up the quest for points in Anderson SC and this event. Although its not a large event in comparison to many , with about 1,000 runners in the 3 races combined, it's a pretty big deal for this small city of about 26,000 in the foothills of South Carolina. By 6pm they shut down a 3 mile stretch of a busy 5 lane blvd that leads into downtown, well in advance of the races. Meanwhile at the YMCA vendors set up tents and there are activities for the families including giant bounce houses and slides. With my race not beginning until 10pm I had a lot of time to kill. The fun finally started with a mile race at 8:15 with about 100 runners. Mostly kids and parents running with smaller children but a local HS XC team had about 20 kids and several adults were taking it seriously. At 9pm it was time for the 5k. A little fireworks display just before the start and then I found a good spot to watch the finishers. There was prize money 3 deep and a group of Kenyans from Chapel Hill , male and female racked up with 1-2-3 finishes. The 1st place male was 14:28 ! Around 9:30 it was time for me to begin my normal warm up routine so I jogged a mile in the Y parking lot and then walked the 2/10ths up the hill to the start. I was really happy to find that we didn't have to start running up it to begin ! With 10 minutes to go I did some strides and then made my way to the starting line. There were quite a few guys that looked my age and looked fit but not the one I was expecting to see. Oh well, just run my race and let the chips fall as I said in the preview. My goal was to go under 49 minutes or at least under 8 mp but if things went well maybe a bit faster. I kind of doubted faster though after looking at the course. No steep hills but a lot of long gradual ones including nearly 1.5 miles at the end before that nice downhill to the finish. The race began right on time and I held back a little on the pace to make sure I stayed comfortable. It was nearly flat but soon started heading gradually down the hill and I didn't want to get carried away too early ! It was still around 78F and the humidity had crept back up to around 70% so it was going to be a warm one. I was happy to find that I had some zip in the legs and was soon cruising along comfortably. I had forgotten my garmin which I normally don't race with on certified course anyway but after awhile I was thinking I should be hitting the first mile but no marker was to be seen. It was dark but there was enough light from street lights and the businesses with lit parking lots but I thought maybe I just missed it. Oh well, just run at effort and not worry about it. Finally made it to the bottom and we had some mostly flat for a bit and I was looking for the 2 mile mark. Never did see one. And then we were in an area with no businesses for a while and with trees and few streetlights causing the visibility to be lacking. And then boom, I was on the pavement. A quick assessment showed no real damage and nothing was hurting much. I looked and saw I had stepped right in the middle of a hole where a small utility access had sunken a few inches. I popped up quickly and was back up to speed in not time. Maybe lost 15 seconds total. I seemed to be fine and running comfortably back at race pace and feeling confident I still was having a good race. Finally made it to the turn around on the out and back course but still no mile markesr. The way the course was laid out though I figured the turn was right at 3 miles and my time was 23:30 and if I was right I was around 7:50 pace even after the fall. I tried not to think too much about most of the race being uphill from there ! There were only about 200 of us and we were pretty spread out but I was still passing a few people and trying to focus on at least maintaining the distance on the ones ahead. Still feeling good and confident. I tried to take advantage of the downhills as much as possible to build a bit of a cushion before the last long climb. I really expected to struggle more but I actually felt pretty good , and seemed to maintain a strong pace over the long grind from about 4.5 to the 6 mile mark. Well again no sign there but I knew once I crested the hill and got back to the start it was about .2 downhill. That was surely a welcome sight by now. I glanced at my watch and it was obvious that I was going sub 49 just as planned and had not lost too much off the pace up the hill. Zoomed down the hill and crossed in 48:53. Got that part accomplished. Now I just had to wait and see if I made the podium, my #1 goal. It took a while but finally the results started rolling in and the preliminary results had me 3rd in my age group. The two guys in front of me were locals and they were amazing ! Even in pre-injury shape I was not going to beat those guys ! In fact they were so fast that they actually beat all the 50 year olds and so took 1-2 in the Grandmasters division. I was bumped up to 1st in the age group. One guy in the 65 to 69 age group finished in front of me so in the Grand Prix points I am in 3rd in my age group and 4th in the Senior Grandmasters division. I was hoping for a little better but it's only the first race and barring something getting in the way of my training, I will get in better shape and back to 100% hopefully by the time for the next race in 7 weeks. So that's all for now. Stay tuned for updates along the way.